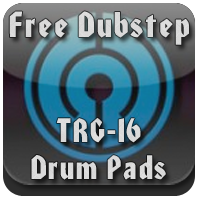 Free Dubstep TRG-16 Drum Pads for NanoStudio iPhone and iPad app. We enjoy our NanoStudio app so much but felt it was missing more options for the TRG-16 Drum Pads. So what did we do? We made an awesome Dubstep kit just for NanoStudio as a free download. Hows that! Just add to your cart and checkout. It's free and you get a download link immediately.